Here is a side dish anyone can enjoy. I love sweet potatoes. I eat them weekly. They are a great source of fiber and satisfy my sweet tooth in a healthy way. Crank up your oven and get ready for an easy recipe I found at Kitchen Daily for roasting sweet potatoes. Peel potatoes, then cut into 1/2-inch cubes and put in a large 4-sided sheet pan (18- by 13-inches). Toss with 1 1/2 tablespoons oil and 1/4 teaspoons each salt and pepper in pan, then spread out and roast, stirring once, until tender and browned, 15 to 20 minutes. 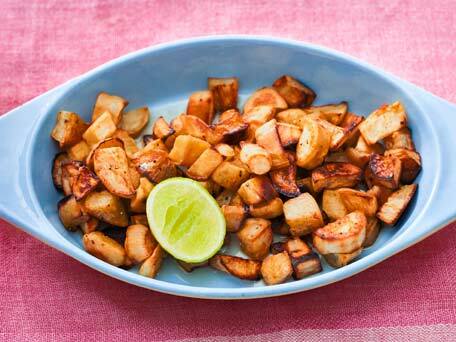 Stir together lime juice and honey in a large bowl, then add hot potatoes and toss well. Season with salt and pepper to taste and drizzle with remaining tablespoon of oil. Note: Roasting cubes of sweet potatoes in a hot oven gives you delicious caramelized flavor and reduces the cooking time drastically. The lime and honey gives this dish an addictive tart sweet note.